Serpentine, a hydrated silicate of magnesium (H4Mg3Si2O9) is a common ornamental stone that is frequently used as an imitation of jadeite and nephrite because of its similar aggregate structure and colour appearance. It is usually seen in variable hues of blue, green, and yellow, and comprises species such as antigorite, chrysotile, and lizardite, and varieties such as bowenite, williamsite, and ricolite. A phenomenal chatoyant variety is also rarely encountered (see e.g. Choudhary, 2009). A fibrous variety known as satelite, displays a chatoyant effect when fashioned as cabochon. This material has been reported from Maryland and California in the U.S. (Webster, 1994) and from Sichuan Province in China (Lu et al., 2005). 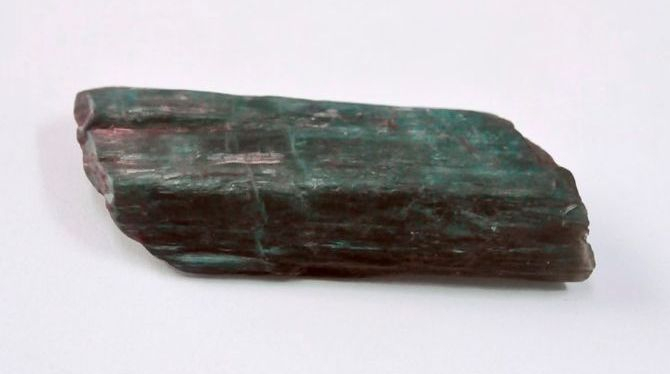 The author encountered one specimen of dark bluish green serpentine (Figure 1) weighing approximately 19.52 grams, which was unusual in two respects - one for its crystal form and the other its purple-red transmission. The tested dark bluish green specimen of serpentine was submitted for identification at the Gem Testing Laboratory Jaipur, India. The material was presumed to be an alexandrite and was mined in Andhra Pradesh, Southern India. Standard gemmological tests except RI measurements (because of the rough surfaces) were performed. Hydrostatic specific gravity (SG) was measured using Mettler Toledo CB 1503 electronic balance. Exposure to standard long-wave (366 nm) and short-wave (254 nm) UV radiations was used to document fluorescence reactions. The spectrum was observed using a desk-model GIA Prism 1000 spectroscope. The internal features of the sample were examined with a binocular gemmological microscope, with fibre-optic light due to the low transparency of the sample. In addition, the infrared spectrum in the 7000–400 cm-1 range at resolution of 4 cm-1 and 50 scans was recorded using a Shimadzu IR Prestige 21 (FTIR) spectrometer at room temperature with a diffused reflectance accessory; the spectra obtained were then converted into absorption spectra using the associated software. Qualitative EDXRF analysis was performed using PANalytical Minipal 2 under two different conditions. Elements with low atomic number (e.g., Mg, Si) were measured at 4 kV tube voltage and 0.850 mA tube current. Transition or heavier elements were measured at 25 kV tube voltage and 0.025 mA tube current. The specimen had a dark bluish green colour with a low heft and dull to greasy lustre indicating low hardness (see again, Figure 1). The low hardness was confirmed by scratching with a fluorite crystal on an inconspicuous part of the sample. The specimen displayed distinct crystal shape and form. The crystal was tabular with sets of pinacoids displaying bladed/lamellar habit and fine striations along the length of the pinacoidal faces. Careful observations of the crystal faces revealed that the striations were actually the layers that formed stepped pattern; such features are associated with the cleavage planes. The shape and angles between the faces indicated that the crystal belonged to the monoclinic system. Lower heft and dull to greasy lustre however, pointed to the specimen being serpentine, but the presence of crystal from was a problem in reaching this conclusion. Webster (1994) states that the mineral is always massive and is never encountered as crystals. However, Dana & Ford (1932) has stated that distinct crystals are found only as pseudomorphs after pyroxene, amphibole, spinel, chondrodite, garnet, phlogopite, etc. The author has also observed only the massive form of serpentine in the past. However, the option of serpentine was still open and further tests were performed. Because of its low transparency, the crystal was rotated in all directions under a fibre optic light source for a thorough observation, which illustrated one of the stone’s more striking features. The sample displayed purple colour when light was partially transmitted and reflected from the fractures/cleavage planes present within the crystal. 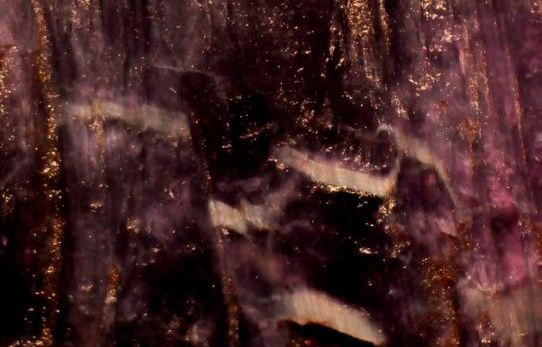 As the crystal was held against the fibre optic probe/lamp and the light was allowed to transmit completely, it appeared purple-red (Figure 2) similar to some garnets, spinels or even rubies. This was one of the most amazing features observed in a specimen, which was presumed to be a serpentine. This conclusion was still to be verified. Figure 2: The serpentine specimen in figure 1, appeared purple-red when observed in strong transmitted light; an unusual phenomenon for serpentine. This effect is mistaken for a colour-change effect and such specimens are misrepresented as alexandrite. Gemmological properties as observed in the dark bluish green serpentine crystal are described below and in Table 1. Because of the lack of transparency and rough state of the specimen, all of its distinguishing properties could not be measured. However, hydrostatic SG was measured at 2.59, and under desk model spectroscope a broad band in the yellow-green region was observed with fine lines in the red end. Under long-wave ultraviolet light, a weak yellow-green glow was visible. The SG value and UV fluorescence were consistent with those for serpentine; however, the absorption spectrum was different as expected, because of the purple-red transmission. 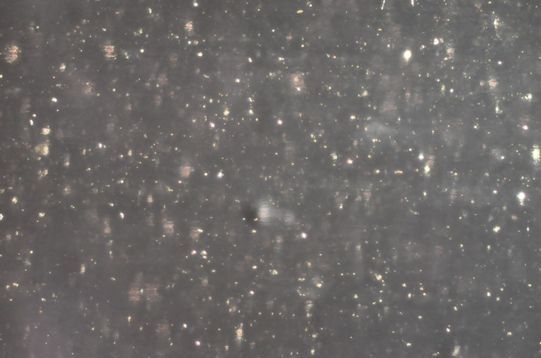 Observations under a microscope using a strong fibre optic lamp revealed numerous fine layers on the surface with a step-like pattern (Figure 3). These have been formed due to the presence of cleavage planes. Such patterns were visible on two faces opposite to each other, indicating one direction of cleavage plane. Further, when light was transmitted through the specimen some scattered tiny black crystals were seen. These crystals when examined in reflected light displayed a metallic lustre. Such crystals have been reported as chromite or magnetite (Webster, 1994). In addition to these scattered crystals, the specimen also contained fine dotted inclusions arranged in planes (Figure 4). The exact nature of these inclusions could not be resolved with a standard gemmological microscope, but appeared to be oriented along the cleavage planes. Further, some areas also displayed thick but short whitish/cloudy veins (Figure 5). Whitish veins in serpentine have been reported to be of brucite (Webster, 1994), but the veins present in this sample appeared as a part of the serpentine itself rather than any other mineral. Figure 3: Fine layered or step-like pattern on the surface of this serpentine crystal indicating cleavage planes. These were present only in one direction. Also note the purple colour of the serpentine, which was observed when light was partially transmitted through the crystal. Magnified 25x. Figure 4. Minute scattered pinpoints / dotted inclusions were present throughout the specimen in planes, which appeared to be oriented along the cleavage direction. Magnified 45x. Figure 5: A few white/cloudy wavy veins were also observed in some areas of this serpentine crystal. Magnified 35x. Because serpentine is a hydrous material, the FTIR spectrum in the 7000–400 cm-1 range exhibited complete absorption from 4500 to 400 cm-1, bands around 7170, 5000 and 4700 cm-1 and a peak at 7345 cm-1 (Figure 6).. These bands are related to OH and Si-OH combination modes (Frost et al., 2007). However, Lu B. et al. (2005) mentions observing bands at 3700-3600 cm-1 (attributed to OH vibrations), 1100-948 cm-1 (Si-O vibrations), and 600, 570, and 440 cm-1 (OH, Mg-O, and Si-O vibrations) in the IR spectrum of a chatoyant serpentine. These bands / features could not be observed in this sample due to the complete absorption of wavelengths below 4500 cm-1. The IR pattern observed for this sample was similar to those present in our database and those reported by Choudhary (2009). Figure 6: Infra red spectrum in the 7000–400 cm-1 range exhibited complete absorption from 4500 to 400 cm-1, bands around 7170, 5000 and 4700 cm-1 and a peak at 7345 cm-1. These features are consistent with those reported for serpentine. Qualitative EDXRF analyses revealed the presence of Mg, Si, Cr, Fe, and Ni, which is consistent with the elements expected to be detected in serpentine. No element of key significance was detected, which could suggest the cause of purple-red transmission. A clear conclusion cannot be given due to the fact that chromium has also been encountered in other samples of serpentines without this purple-red transmission. For example, in the chatoyant serpentine mentioned in the references (Choudhary, 2009), also displayed chromium content in similar amounts, but no purple-red transmission was present. Therefore on the basis of visual characteristics, specific gravity, FTIR spectra and chemical composition, the specimen was identified as serpentine. This was the first time this author has encountered this rare variety of serpentine showing crystal form and a purple-red transmission. The literature search however, revealed the presence of crystals of serpentine but only as pseudomorph after other minerals. It is not known, which mineral has been altered resulting in the formation of this serpentine crystal. . The exact cause of this purple-red transmission is unknown. However, a few more specimens of serpentine exhibiting purple to purple red transmission were observed in the recent past at the Gem Testing Laboratory Jaipur, India and all were mined in Andhra Pradesh, Southern India. This purple red transmission is mistaken for colour-change effect and the specimens are sold as alexandrites, especially in India. Choudhary G. (2009) Serpentine cat’s eye. 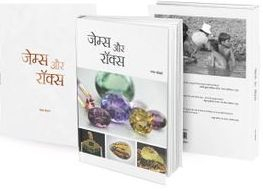 Gems & Gemology, 45(2), pp. 151-152. Frost R.L., Palmer S.J. and Reddy B.J. (2007) Near-infrared and mid-IR spectroscopy of selected humite minerals. Vibrational Spectroscopy, 44(1), pp. 154-161. Lu B., Xia Y. and Qi L. (2005) Infrared absorption spectra of serpentine cat’s eye from Sichuan Province of China, Journal of Shanghai University, 9(4), pp. 365-368. Webster R. (1994) Gems, 5th ed. Revised by P. G. Read, Butterworth-Heinemann, Oxford, UK, pp. 369-372.